There's been a whole lot of cooking going on but not a lot of writing. We were skiing over New Year's as we won't be able to go over February break this year. Nine of us met up in Colorado and we had our usual array of meals, plus one night out. Roast chicken and biscuits, burrito and guacamole night, pasta with lamb sauce, and fettuccine carbonara. Breakfasts included scrambled egg burritos, croissants from a local bakery, and lots and lots of Pop Tarts. Lunches were less inspired and consisted of sandwiches when we were skiing and homemade chicken soup when we were in. Thanks to my husband doing most of the shopping at a Save-A-Lot, it was the most economical year ever as far as food costs. And many hands meant that every night someone different cooked which was nice, too. The skiing was very cold, but at least there was snow. There's nothing in our area and, up until the last week, it's been too warm to make any snow that will last. Anyway, since we've been back I've been getting ready for pastry school. Orientation was 3 days ago and classes start on Monday. I'll be taking lots of photos as I have to make a portfolio of my creations as part of the required assignments. 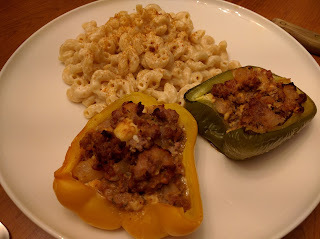 Tonight's dinner was comfort food - stuffed peppers and mac and cheese. The peppers were stuffed with a mixture of ground lamb, onion, feta cheese, tomato sauce (yellow tomato sauce from our mason's wife), and rosemary. The macaroni was mixed with a sauce that started as a bechamel sauce (roux plus milk) to which I added Monterey Jack, cheddar, and cream cheese. I've decided that cream cheese or mascarpone is an essential ingredient to making a smooth and creamy mac and cheese. It's really rather tasty!